The Juzo Dynamic Arm Sleeve, 20-30 mmHg contains the arm in a circular knit garment to reduce swelling post-surgery when lymph nodes have been removed. The firm 20-30 mmHg compression encourages lymphatic flow back to the heart to drain the fluid in the arm. 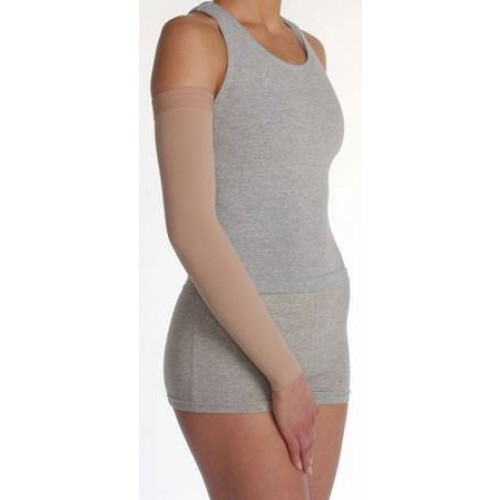 These Juzo Arm Sleeves effectively treat swelling associated from edema and lymphedema. The sleeves come in a variety of colors so you can personalize your arm sleeve. There are also regular and long lengths with optional shoulder strap design to aid in keeping sleeve up. Dynamic Arm Sleeves are very durable and are constructed from latex-free Lycra. Juzo's compression garments stand out in quality due to its high quality Lycra inlay threads. To achieve the consistent compression level throughout the arm sleeve the Lycra inlay threads are knitted into the material with adjusted tension based on the compression level. Juzo 3511 Series Dynamic Compression Arm Sleeve, 20-30 mmHg are machine washable. Choose the best fit using the size chart. If you have mild to moderate lymphedema, you may also be interested in Soft Arm Sleeve with a silicone border.